The Christmas Craft Collab: No. 6, Reindeer Ruckus! Ah! The reindeers! They're coming! Dasher, Dancer, Prancer, Vixen, Comet, Cupid, Donner, Blitzen, and Rudolph! Nah, just Mia, Kit, Katie, Sam, Julie, Josie, Elly, Madi, and Amy! 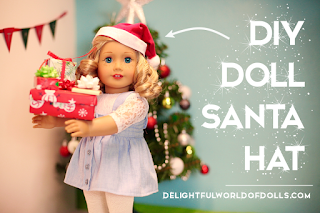 You can turn your dolls into little reindeer too - right after you turn one into a Santa! Madi, the epic collaborator, made this ADORABLE DIY Doll Santa Hat which you should TOTALLY make! Let's launch our sleigh right into this craft! - AGFan's Duck Tape Headband Tutorial - This is what I used as the headband base for this craft. :) Instead of the elastic cord, I used an almost frayed hairthing. It's PERFECT! I'm sure you have some of those lying around, or an already snapped one! It's stretchy and literally the perfect length! After drawing/tracing and cutting out your paper antlers and ear (note that I only said one ear, since you can just trace it twice), trace those onto the brown felt with the Sharpie and cut them out. MAKE SURE TO ADD LOTS OF EXTRA LENGTH AT THE BOTTOM, AS YOU CAN TELL. You'll need this to glue onto the headband. I added a smaller white section to my ears, just to break up all the brown. Just cut your template smaller and trace it onto the white. USE THE HOT GLUE GUN WITH EXTREME CAREFULNESS (unless of course, it's being awful and taking forever to heat up). 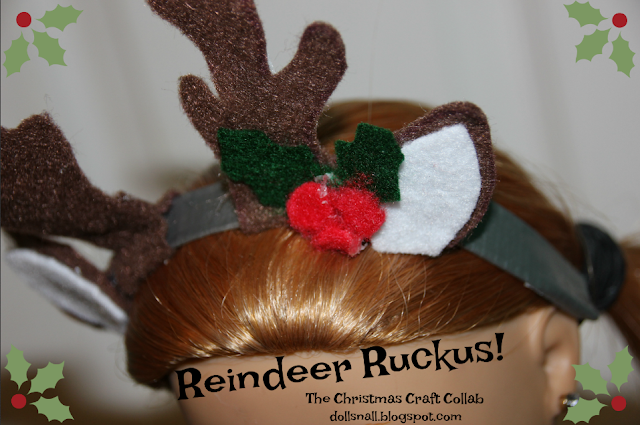 Place the antlers on one side of the headband and fold the extra length under and around. Hot glue the extra length to the back of the antler (I also added a strip of hot glue to the actual headband to help keep it in place. This was super helpful - so hot glue the extra length to the back of the antler and the actual headband). Repeat with both ears. Use the pipe cleaners to hold up the antlers by inserting it into the folded over section and up the back of the antler. They should NOT show from the front. Next, the fun decorating part! Cut three small (very small!) circles from the red felt and two holly leaves from the green felt. Obviously, hot glue it onto the headband. You can add mini jingle bells or pom-poms now if you'd like. If you make one of these headbands - or any of the other CCC crafts for that matter (mine or Madi's) - email me with pictures at dollsnall4ever@gmail.com! I'd love to see what you do! Have fun, and don't burn yourself with the hot glue gun! Well, I gotta go catch those crazy reindeer *nods head toward Mia and Katie*. Wish me snowflakes! I did a little research and caribou and reindeer are the same species, with only small differences. So if you want to see a reindeer, just come to Alaska! AHHH THAT LOOKS SO AWESOME! If I have the materials to make this I AM MAKING IT OKAY.